Audience/Genre: Mature YA, New Adult, Paranormal, Science Fiction. Holy baby aliens (as Katy would say) this book is so freaking intense! For me, it is EPIC! The best one yet of the series! You know when you get to sit down with a book you have waited so long for and when you read the first sentence you have a big grin on your face and a sigh... yeah, that was me. I have had this book since the day it came out and I could only look at it because I had a few commitments first. So, I was so happy to sit down and jump into it. This book is very different from the others in the series. There is a darker side here. Katy goes through a lot while being captive. I wasn’t sure what to believe as Katy wasn’t sure either. There is a lot of death too. Katy and Daemon would do anything to spare the other harm. And they both go through a lot. 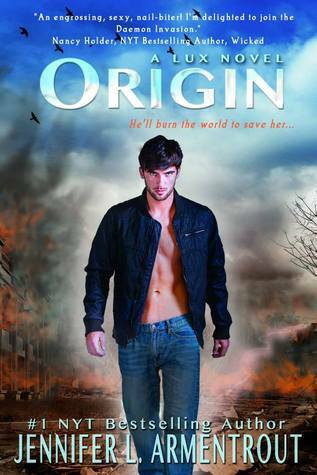 Daemon would burn the world down and expose what he is to save her. He pretty much does everything to get her back from the Daedalus. Then he goes through even more to keep her safe. There are so many twists and turns that you CAN NOT guess what will happen by the end. Because Ms. Armentrout keeps throwing curve balls and you just wouldn’t believe all that she threw in there to blindside you. I mean, I was like What? and then -No way... and then, Oh my Gosh and Shut The Front Door! Daemon shows a softer side here too. He loves Katy and lets her know it! Archer is an enigma that I want to figure out as is Luc. We learn a little about them in this book. But if you haven’t read this series, you really need to. Ms. Armentrout is an excellent author and I love her writing. I am still in shock over the ending here and don’t know what to write except that you need to read the series. I can not do a justice review on this book. I finished it days ago and I still am blown away by all that happened. I can only get fragments of thoughts out to you since there is so much that happens in this book and I dare not spoil any of it for you. I don’t think though that I would let my 13 year old read this series though. Great review. I haven't had time to start this one yet, and have been really nervous. I don't want to be left with a cliffhanger like Opal.